1. I love my …! 2. Looking in the mirror, I see …! 3. The best thing that happened to me this week was …. 4. … is one of my favorite things to do! 5. I always have a good time …. 6. I’m looking for … this weekend. 7. “Oh, I’m bein’ followed by a …“. 1. I love my car! 2. Looking in the mirror, I see a ghost! 3. The best thing that happened to me this week was getting my own office again. 4. Walking with the dogs is one of my favorite things to do! 5. I always have a good time when I’m taking pictures. 6. I’m looking for a small blue and white Japanese dish and some new tshirts this weekend. 1. I love my Kids! 2. Looking in the mirror, I see A lot of gray in this red hair of mine! 3. The best thing that happened to me this week was Hanging out with my best friend. 4 Reading is one of my favorite things to do! 5. I always have a good time on the Blue Ridge Parkway! 6. I’m looking for a Handyman this weekend. 7. “Oh, I’m bein’ followed by a Moonshadow (well, next week I will be)”. Done at my place. I was making up something stupid for #7 and then the song popped right into my head. Now it won’t go away! Yay for a office to yourself, I like having my own space myself. Congrats on your new office! I am loving that painting of the ocean you have on the wall. I put my Friday fill-in on my site. 2. Looking in the mirror, I see a sleepy, curly haired woman! 3. The best thing that happened to me this week was extra time with my sweetheart. 4. Kissing is one of my favorite things to do! 5. I always have a good time with my friends. 6. I’m looking for time to take care of some stuff at home and a little R&R this weekend. 7. “Oh, I’m bein’ followed by a a cat who wants me to stay in the bathroom while he’s eating his food”. Nice arrangement at your new office! Mine are posted up on my site. Love the new office. I am still in cube land…. 2. Looking in the mirror, I see …lots of sun damage!! 4. being on the beach… is one of my favorite things to do! 6. I’m looking for scrap-book things… this weekend. 1. I love my husband! 2. Looking in the mirror, I see ME! 3. The best thing that happened to me this week was I wrote a prayer for some friends and they loved it. 4. Swimming is one of my favorite things to do! 5. I always have a good time making decorated cakes. 6. I’m looking for warmer weather this weekend. 7. “Oh, I’m bein’ followed by a dog that is living here now.”. i hope you find what you’re looking for this weekend. 1. I love my … new house! 2. Looking in the mirror, I see … big blue eyes! 4. Travelling … is one of my favorite things to do! 6. I’m looking for … patio furniture and citronella torches this weekend. 7. “Oh, I’m bein’ followed by a … weird neighbor”. How can Mel see ME in the mirror? 1. I love my …laptop! 2. Looking in the mirror, I see …the years have not been kind!! 4. Watching old movies… is one of my favorite things to do! 6. I’m looking for …puppy playtime outside this weekend. 7. “Oh, I’m bein’ followed by …two little puppies all of the time”. 1. I love my …family and my coffee perk. 2. Looking in the mirror, I see … too much grey hair and weight I need to lose. 3. The best thing that happened to me this week was …. Little Princess told me she wanted to marry me and that she was lucky I was her mommy. 4. Blogging, Reading and Digitalscrapbooking… are some of my favorite things to do! 6. I’m looking for … Rest and Time to clean my house this weekend. 7. “Oh, I’m bein’ followed by a … cute little five year old princess”. 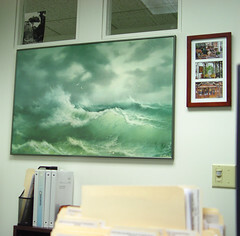 What a beautiful picture in your new office! Ah, Van Morrison is so sweet, just gave me a good ole feeling. Oh, I’m getting ready to post mine soon. I’ve been running late today. I played! Congrats on the new office, love the painting! 2. Looking in the mirror, I see a bright blue top! 4. Reading is one of my favorite things to do! 5. I always have a good time with my husband. 6. I’m looking for gracefullness this weekend. 7. “Oh, I’m bein’ followed by a nosy assistant”. heh, i filled my out before reading yours and we pretty much said the same thing for #4! 1. I love my …new remote control for my camera! 2. Looking in the mirror, I see …some wild hair today. 3. The best thing that happened to me this week was ….I got to come home to see my baby. 4. Taking pictures… is one of my favorite things to do! 5. I always have a good time ….taking a hike with my son. 6. I’m looking for … a good time this weekend. 7. “Oh, I’m bein’ followed by a … Moon shadow, moon shadow moon shadow.” I love that song! 1. I love my two sons! 2. Looking in the mirror, I see someone making positive changes! 3. The best thing that happened to me this week was I met a hopeful contact at a Job Fair. 4. Playing on the internet is one of my favorite things to do! 5. I always have a good time with my close friends. 6. I’m looking for rest and relaxation this weekend. Oh if i ever lose my hands,oh if…. I wont have to browse no more. Yes if i ever lose my eyes,oh if…. “. I’ve decided to add this to my blog as well! 1. I love my new Piglet pen! 2. Looking in the mirror, I see new wrinkles, dark spots, gray hair, and something rather strange – oh yea, I think it’s what they call a smile. 3. The best thing that happened to me this week was my court date finally arrived! 4. Spending time with Jessi & Matthew is one of my favorite things to do! 5. I always have a good time at the beach. I think it’s about time for a visit. 6. I’m looking for time to look at apartments and fill out Jessi’s ECOT application this weekend. Congrats on your new office!! I love the painting! Have you seen the cover for the new HP book? 1. I love my job! 2. Looking in the mirror, I see a devastatingly handsome man with cool glasses…of course I may also be dreaming! 3. The best thing that happened to me this week was that I got to hang out and talk with Bob Schieffer and Tim Russert. 4. Singing Elvis Costello songs in my car is one of my favorite things to do! 5. I always have a good time with my son! 6. I’m looking for some new Dave Eggers books this weekend.